The use of fireworks was first recorded in England in 1486 at King Henry VII's wedding, but it was during the Victorian period that their potential was most fully developed. Improvements in technology and a deeper understanding of chemistry meant that bigger and more impressive fireworks could be produced and public firework displays became popular. The success of Charles Brock's spectacular "firework fetes" at the Crystal Palace during the 1860s and 70s inspired other pyrotechnists to emulate his dramatic displays. 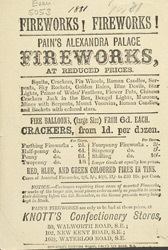 James Pain was one of the winners of a firework competition held at Alexandra Palace in 1876. He enjoyed increasing success with spectacular displays "specially arranged for birthdays, majorities, weddings, public & private fetes..." By November 1881, he was also able to offer an impressively large variety of fireworks for sale.